I’ve recently created an application for schools to apply to be highlighted in the School Spotlight at SchneiderB.com. I was really excited when Patrick Scott, Associate Director of Middle School Admission at Maret, completed the application and introduced me to the Instagram account at Maret. Publish photos that create engagement and resonate with the Maret audience. I’d like to thank Patrick for introducing me to the Maret Instagram account and for taking time to answer the School Spotlight questions. 1. 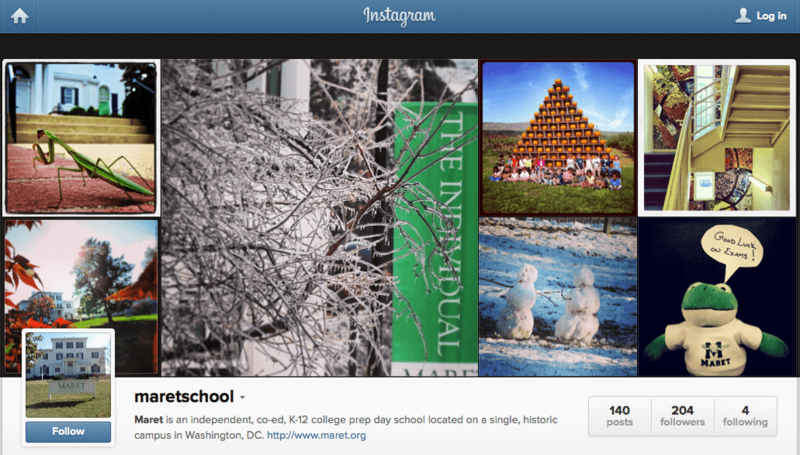 How long have you had an Instagram account at Maret? We started the Instagram account in March of 2013, so a little less than a year. 2. What were your initial goals/reasons for starting your Instagram account? I thought it would be a fun way to connect with our current students, and also connect with kids who might be looking at Maret during the admission process. Also, pretty pictures. Instagram filters are awesome. 3. Have you achieved those goals? I think so, yes. We have a core group of followers including current students, applicants and alumni. 4. Were there unintended consequences, positive or negative, as a result of using Instagram? Because of all of the various social media that we use, I did a presentation for our Upper School students showing them all of the ways Maret is present, and I think they were kind of shocked at the ways we were reaching out. I see that as a positive that wasn’t necessarily something I would have noticed before. They particularly liked seeing what we were doing on Instagram. It definitely was a positive for them to see how active their school was on social media, including Instagram. 5. How many people help you manage Maret’s Instagram account? For Instagram, it’s just me. 6. How much time do you spend managing your Instagram account? Maybe 15 minutes a week, if that. If you look at Instagram, it’s basically beautiful photos coupled with interesting content. I don’t think it should be ‘over thought.’ I just kind of jumped in and started it with the goal of having fun and connecting. 7. How frequently do you post to the Instagram account? It goes in spurts. I try for at least once a week, but sometimes it may end up being 2 or 3 times a week. 8. In your experience are there better days or times to post to Instagram? It seems like it doesn’t really matter what time we post, we’ll end up with about the same number of ‘likes’ for a pic. 9. What tools do you use to help you manage your Instagram account? 10. How do you measure your efforts on Instagram? Generally by how much engagement there is on the page–whether likes or comments. 11. Is there a certain type of post that is more successful than another? The ones that gets the most likes are the shots that include our oldest building on campus–Woodley House. It is a very recognizable part of your Maret experience, and it photographs really well. 12. How does Instagram integrate with your other social media channels? We sometimes share Instagram out via Twitter or our Facebook page. We also did a fun Instagram video that I added music to and we send out to our visiting applicant families to show them where to go for a tour. Here’s the link to that. 13. If you knew then what you know now — what advice can you share for schools just starting with Instagram? Just jump in and do it–it’s not a huge time commitment and if you do it right, it can really show your school in a beautiful new light. Literally. Also, hashtags are fun–you can use them to categorize pics, but you can also tie them into pop culture, or the neighborhood your school is in to cast a wider net. 14. Can you share one ‘secret’ which has helped your Instagram account to be successful? I love that our Instagram has kind of morphed into the ‘voice’ of the Frog mascot in some ways–the little speech bubbles that I can use to have him ‘say’ things to our community is something that makes Instagram, for us, a bit more interesting. I’d like to thank Patrick and Maret for agreeing to be a School Spotlight. If you haven’t done so already I also encourage you to check out Maret’s Instagram account. Thanks, Becky! That feedback is great–I really appreciate it! Hi @disqus_VabSlkkSMG:disqus – I’m so glad that you enjoyed the post and found it helpful! What a great post – I love Patrick’s advice to “Just jump in and do it.” Instagram is one of the best places to share visually what’s happening at your school, allowing you total control over the content you post. Patrick’s positive attitude is apparent in the photos he shares and the snapshots he is giving the rest of the world into the people, places and missions of Maret. Thanks for sharing, Brendan! You’re welcome @bryant_palmer:disqus and thank you for commenting. I, too, have seen strong engagement on our Instagram photos, especially from our younger demographic.